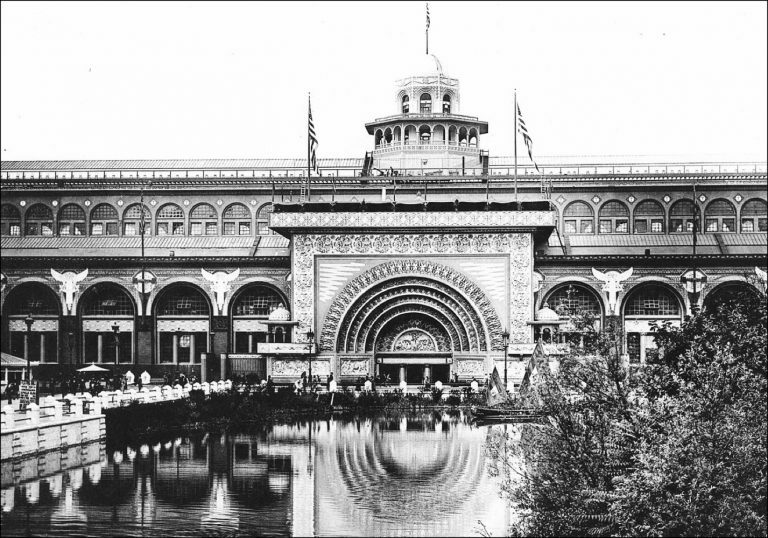 Chicago, IL — It was over 125 years ago when Hyman Freedman and his employer, Columbia Cab Company, exhibited at the 1893 World’s Columbian Exposition in Chicago. Hyman Freedman exhibited in the popular Transportation Building (now Rogers Park in Chicago). An elaborately decorated golden arch surrounded the main entrance, and the interior design resembled a Roman basilica. Planners divided the exhibits into three parts: railway, marine, and vehicle. According to the official event directory, Columbia Cab Company featured baby carriages, stools and other small furniture. After the World’s Fair closed in October of 1893, celebrations continued. 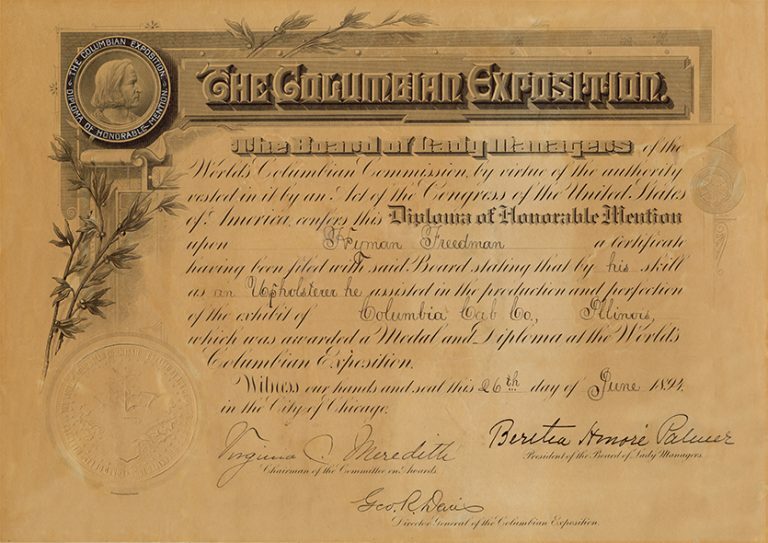 On June 24, 1894, Hyman Freedman was awarded a diploma of honorable mention for his upholstery skills at the event. As the 20th century approached, Freedman began making seat cushions for horse-drawn buggies. Prior to the Great Depression, the Hyman Freedman Company patented several spring structures and other seating related technologies. A changing economy and advancements in transportation would bring opportunities with delivery trucks. Hyman began making driver seats for small delivery companies. Today, Freedman Seating supplies driver seats for major package handling services including UPS, FedEx and the United States Postal Service. Third generation leadership came with Gerald Freedman, who graduated from the Illinois Institute of Technology in 1959 with a degree in Engineering. Although he worked with the company throughout his education, “Jerry” was full-time the year he graduated. The eventual President and CEO continued developing new products and patenting technologies that would lay a foundation for Freedman Seating to become North America’s leading supplier of passenger seating solutions. Gerald currently serves as Chairman of the company. By the 1990’s, the fourth generation of family executives would include Craig Freedman, Dave Cohen, and Dan Cohen. After graduating from Northwestern University in 1988, Craig worked as an analyst with Morgan-Stanley before pursuing his MBA from Colorado Mountain College. In 1992, Craig returned to Chicago to focus on strategic planning and operations at Freedman Seating, where he would eventually become President and now serves as CEO. Current President, Dan Cohen, began his career in sales. After graduating from the University of Denver in 1983, Dan spent six years with Lettuce Entertain You managing several restaurants and food service operations. He joined Freedman Seating full time in 1989 as Sales Manager. The company has gone through sizeable increases in revenue, workforce, and space in the 21st century. Global partnerships, new markets, and lean manufacturing have made Freedman Seating one of the world’s largest specialty seating manufacturers serving OEMs, dealers, operators and government agencies. A team of nearly 1,000 employees work out of two facilities, one in in Chicago, IL and the other in Rochester, IN (dba Freedman Mobility Seating) along with sales representation across the US. Today’s headquarters is located on Chicago’s west side, 4545 W. Augusta Blvd. Once home to Motorola, the 500,000 sq. ft. office and factory has an extensive history of manufacturing. Over a century after Hyman Freedman began his work in upholstery and seating, Freedman Seating’s core values have not changed. The family owned-and-operated business is committed to meeting the highest standards in quality and service. In doing so, Freedman Seating continues to be an industry leader as modes of transportation advanced from horse buggies to delivery trucks, buses, trains, ferry boats and more. 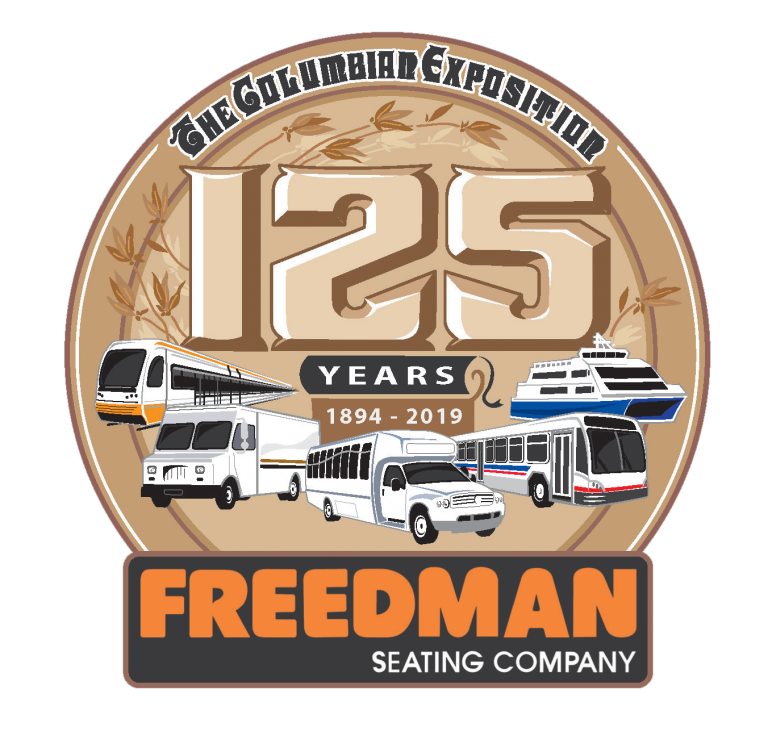 See an expanded timeline of major company events and learn how Freedman Seating will be celebrating 125 Years online at www.freedmanseating.com/125years.